One of the most frequently asked questions in the beauty industry is How can you stop aging? To learn more about that topic I was happy to meet at last week’s Medical Skincare conference in Düsseldorf Dr. Marc A. Ronert, plastic and reconstructive surgent, author and his wife, Janna Ronert, the founder of the established skin care line IMAGE SKINCARE. 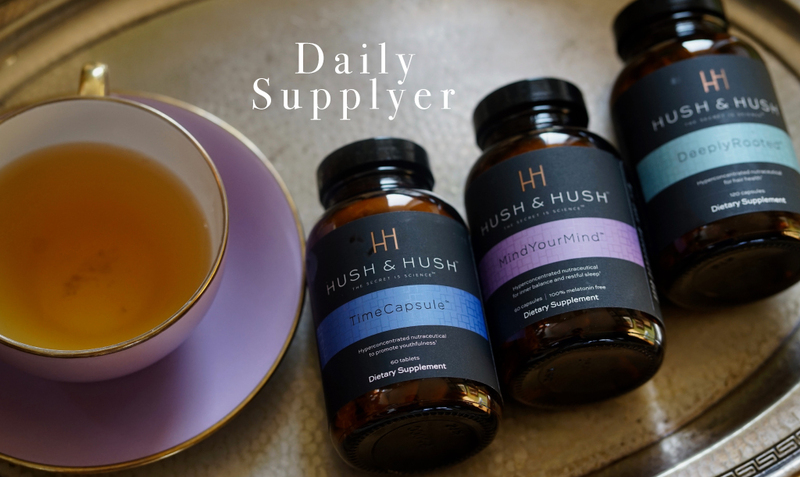 Both of them currently launching worldwide their new developed handcrafted, luxury nutraceuticals brand HUSH & HUSH based in Jupiter / Florida. When I met both of them at the Living Hotel de Medici in Düsseldorf, in one of the hotels splendour rooms, it suddenly all made sense when they told me about their health-conscious lifestyle. Both of them are following mostly a vegan diet, a perfect work/rest balance, sports and a manageable amount of stress level. They have been researching for nutrition and cell science for 15 years, working together with scientists to find the ultimate chemical free formula to create a supplement that decelerates aging in the most natural way. In the sense of their business HUSH & HUSH, which has the logo of a gesture, we are talking about their secret. IRMA: What makes your formula unique in comparison to other nutraceuticals? JANNA RONERT: I would say the blend and combination of natural vitamins, herbs and botanical plant extracts with our modern-day technology is the key of our products. They are so pure and concentrated (no fillers, synthetics, additives or artificial flavoring or coloring) and have a patented combination so that they are most effective to bring you all the vitamins and minerals that strengthen your body from the inside against aging. Also, of course the sources where we are obtaining each high value ingredient and the way it is treated in a very holistic synergy that is powerful enough to act inside our human cells to become a perfect nutraceutical is our secret, HUSH & HUSH (she smiles). IRMA: How important is one’s lifestyle when it comes to aging? DR. MARC A. RONERT: I would say that about 10 % is dictated by genetics and the rest is based on the choice of your diet, your way of life. A healthy lifestyle makes it easier for the cells to function and limit the DNA-induced damages, all this decelerates the aging process and besides it makes you feel more active and alert every day. 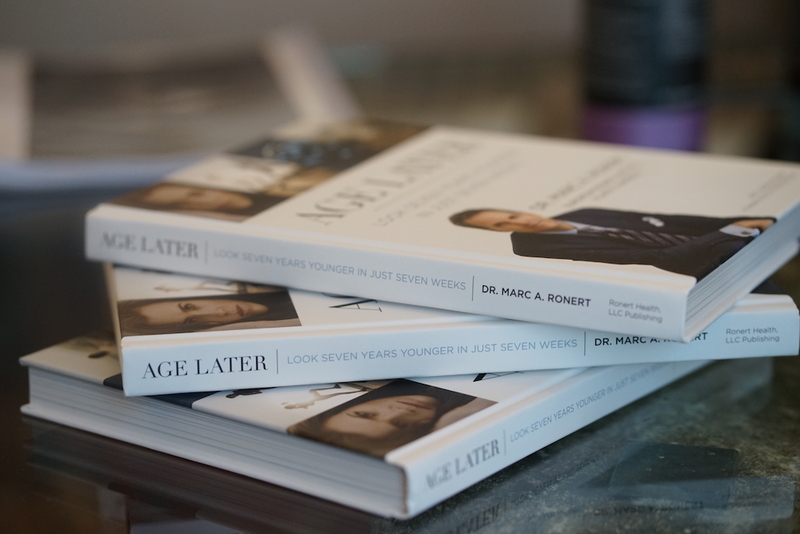 „Age later“, Dr. Marc A. Ronert’s bestselling book. IRMA: Janna, you are the mother of nine-year-old twins and you are working and constantly traveling, how do you manage to keep your stress level down? JANNA RONERT: I start my day with our protein shake PlantYourDay™ (coming soon) a power-packed plant-based vegan protein mix with superfoods and super greens, this already gives my body all I need to have a jump start in the morning, I actually don’t need a coffee anymore. When you start your day in a healthy way, automatically you will keep eating fresh, vitamin rich foods during the rest of the day. It is a lifestyle you are following not just a remedy of supplements you are taking. With twins you are always active and even when I travel, I try to move as much as I can. I also take two pills of TimeCapsule™ in the morning, it is supposed to protect cells on skin and body against free radicals with polypodium leucotomos root, panax ginseng root powder and purslane herb. To calm down at night MindYourMind™ relaxes my metabolism without melatonin but valerian root, chamomile flower, magnesium, rhodiola rosea root and many more natural vitamins, like this my body is perfectly tuned to rest, restore, rebalance, revive and reset. 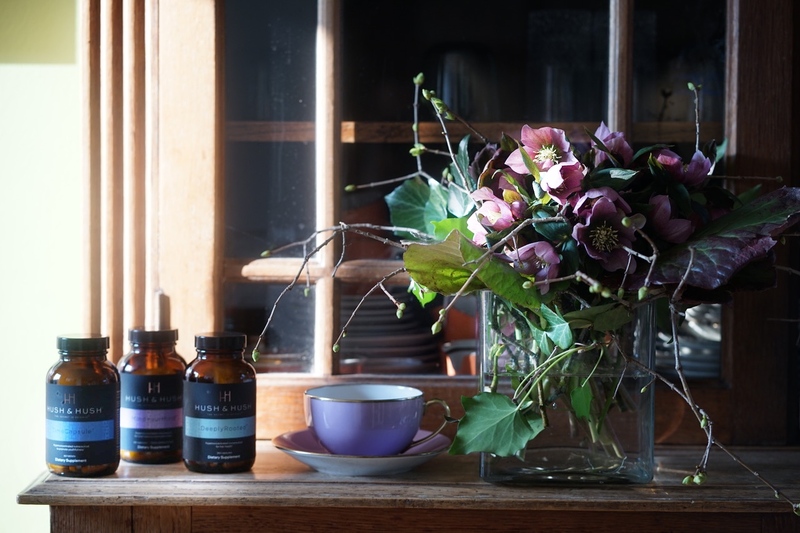 IRMA: Your formula is supporting our body’s natural defence, what are the long term benefits of a product line that works hand in hand from morning till night? DR. MARC A. RONERT: Imagine you could add 10, 20, 30 years of your lifespan, not just getting older, but living a healthy, active life, wouldn’t it be worth it to invest in a healthy lifestyle and the best nutraceuticals? With our range of all products we already developed the perfect scientific match so that the cells get all they need to act and live a healthy long life. IRMA: Where else do you see the state/ age of your body? DR. MARC A. RONERT: On your hair. Your hair is a crown you cannot simply take off. Your hair structure, shine and glow show how healthy you are and feel. 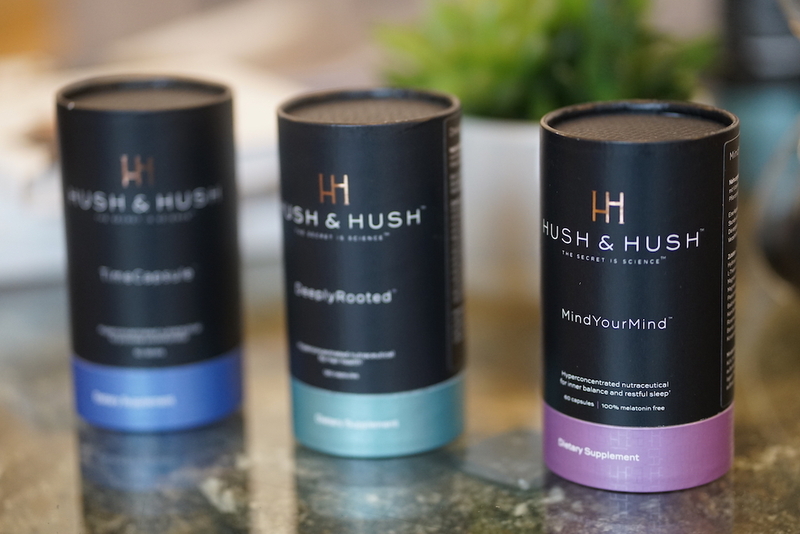 Our specially designed nutraceutical DeeplyRooted™ contains Ashwagandha root extract, Tocopherol and many more enzymes and vitamins that work on a thicker hair density and pushes your hair into a healthy growing phase. The luxury nutraceuticals will be available at very selected dermatologists and plastic surgeons as well as luxurious spas. By the end of April the range will also be available at www.hush-and-hush.de.